- The Thouy hamlet is located on the left bank of River Agout, about 1 km northeast of Lacrouzette. At the start of the 19th Century, more than 20 Thouy family households were registered in the census and records show that Thouy’s have lived here for over 300 years. Pierre Thouy inherited the hamlet in 1962 and, with the help of Marie Thérèse Mialhe, his wife, and his children, he began to renovate the site in order to preserve his family's heritage. And so our 'restoration project' was born! During the week, like most locals, Pierre Thouy worked as a granite polisher in the Sidobre. As soon as they were old enough Jean-Pierre and Domi would go and help their dad restore the hamlet. Marie-Thérèse and Florence stayed at home to look after the business's customers. 1969 - 33 hectares of land were planted with resinous trees. It took several years to clear the fields, plant the trees and keep their roots free of brambles and ferns. - After the death of Domi's grandparents, the family decided to renovate the family home, as the walls were being damaged by worn out guttering. - The family home became the L'Oustal gite and its outbuilding was integrated into the cottage. - Le Frêne was next, but at that time we had to keep an eye on our budget. We installed external doors, windows, inside doors, floor tiles, electricity, and plumbing, before decorating, furnishing and making sure the kitchen was suitably equipped. - "We welcomed our first guests. For the family, it was a chance to welcome a wider public: city-dwellers who wanted a rural retreat, but also preferred to stay in a hamlet that reflected local heritage and regional traditions." - Over the following years, the family renovated the old typically 'Sidobre' house and turned into a '3 épis' gite - La Gorge. - At the same time maintenance of the new pine trees and surrounding forest continued. Once the surrounding fields were cleared, a small flock of sheep were moved in and proved to be excellent 'natural lawn mowers!" Around a dozen sheep currently come to graze in the hamlet. 1990 - Grant and building applications were submitted to the local Conseil Générale and European organisations so that we could renovate 'Le Chalet' and turn it into a '3 épis' rural gite. The administrative procedures went smoothly, but the lack of a crane and scaffolding meant that building works took some considerable time. 1996 - We turned a ruinous garret next to the L'Oustal into a fully refurbished gite. "We had to tear down and rebuild the stone walls." Once transformed into a three bedroom cottage with a bathroom and open plan kitchen/sitting room, we decide to call it 'La Vallée', in honour of its stunning view!” This renovation took us three years. This cottage overlooks the pool and tennis court, and benefits from panoramic views of the Agout Valley. 1999 - Time to attack the swimming pool area! We installed a large, sunny poolside terrace, complete with wooden pergolas, an outdoor shower, a footbath, a changing room and a wooden balustrade that complies with current safety regulations. 2001 - Renovation of the cracked tennis court, which we consolidated by laying a scree over concrete supports. Winter 2002 and 2003 - The renovation of the 'L'Oustal' gite was completed. We increased its size so as to accommodate a shower room and toilet. The external stone walls were finished and we spruced up the courtyard by installing a barbecue area and granite dining table - an old mill wheel from the Las Hortes mill! October 2004 - A harsh winter meant that we needed to resurface the tennis court. We had to act quickly to ensure that all would be ready for the following spring and our influx of guests! 2009 - We didn't have much time on our hands, but we still wanted to spruce up 'La Gorge'. Season 2010 - TV and Wi-Fi were installed in all of the gites and the Prefecture awarded us 3 stars under the ‘furnished accommodation’ category. "On Saturday's we invite all arrivals to join us for an aperitif and share some Gaillac wine and Vabre charcuterie. It's a great way to settle in and we wish we'd thought of this earlier! ». - "Come and help me with the marketing and promotion of the hamlet." We began to construct a mini drinking water treatment plant (supervised by the French regional health board). The bedrooms in the L'Oustal' were repainted. We resealed the pool and changed the sun loungers. On 18th October 2011, Pierre Thouy passed away after a long illness. This was a huge loss to Domi, who often sought his advice and wise words. Sadly, I never got to know him. Winter 2013 - We decided to install an indoor staircase in 'Le Frêne'. We also upgraded the kitchen, adding a dishwasher, a catalytic oven and an induction hob. We repainted and replaced the upholstery. Summer 2014 - we began to focus on the types of guests who'd enjoy a holiday in our hamlet. The GR 36 hiking trail crosses the property and there are numerous walks, hikes and landmarks that visitors can enjoy in the Sidobre and Haut Languedoc. So we decided to apply for the 'Rando-Acceuil’ hiking label. As a result we now provide all information needed by hikers - fact sheets, topoguides, and IGN maps. We can provide breakfast and meals for hikers, all prepared with fresh, local ingredients - please ask us if you'd like a quote. Early 2015 - We repainted 'La Vallée', laid a granite terrace beside 'L'Oustal' and upgraded the pergolas that line the pool. As the tourist industry is developing in leaps and bounds, we published a new website during the spring. In December 2015, we become a 'Refuge LPO' - a zone that protects local birdlife, approved by the French equivalent of the UK's RSPB. We organize nature workshops for kids on holiday at the Thouy hamlet. In 2014, we joined forces with a Castres multi-media company called E-concept and with the help of its owner, Alexandre Santoni, we began to better promote our eco-friendly vision. Being proud of our Occitan heritage, we also joined forces with 'Tarn Coeur d'Occitanie, an organisation that promotes Occitan culture. 2016 - We renovated La Gorge's courtyard and terrace. We also upgraded the petanque (boules) court. The hamlet was awarded two new labels: Marque Parc and Gîtes de France 3 épis (3 stars). We're also upgrading our Wi-Fi network. A router and a new terminal will now send a signal from our house directly to the hamlet. The three nearest cottages have a good signal, but it's a bit slower in le Cerisier and La Gorge. In October 22, Domi had a serious forestry accident that left him with open tibia and fibula fractures and which required several weeks of bed rest. 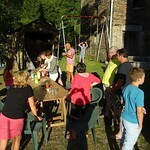 With Domi supervising things from afar and myself in the hamlet, I took over the management of the gites. Housekeeping, dealing with bookings for 2017 and, of course, chasing after our four-legged assistants (10 sheep), who are budding escape artists. I was actually quite a good shepherdess and got used to racing along paths and across fields - although I owe a great big THANKYOU to our neighbours! We're continually working on improving the hamlet. Armed with a cane and extra determination, Domi returned to the hamlet in January. We wanted to improve reduced mobility access to Le Cerisier, a bungalow perfectly suited to this purpose. We began by installing a ramp. We renovated and refurnished the living room, widened doorways to the bedrooms, bathroom and toilet and then redecorated the gite.